This is Page 2 of 2 - the best of August 2007! The photos on this page continue with August 19th and go through the end of the month - trips to Mt. 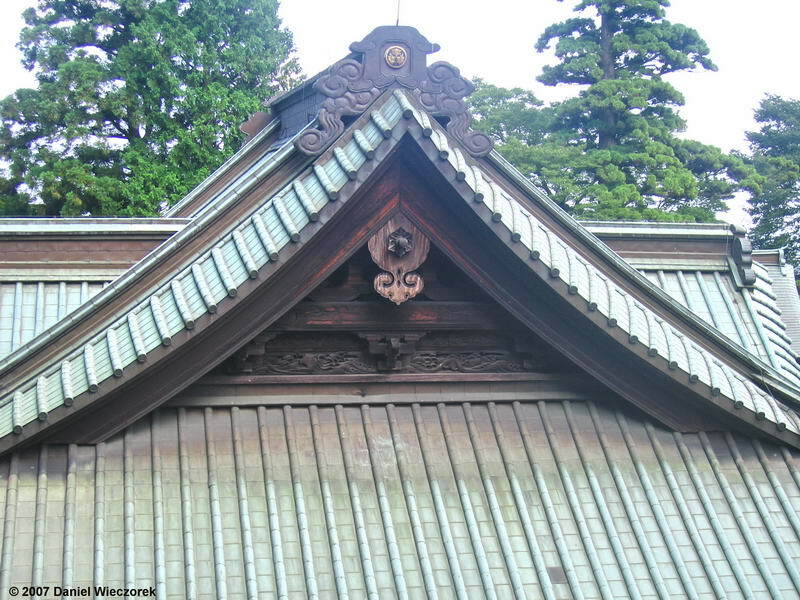 Takao, Nippara and also some airplane photos. Click on any thumbnail to begin. 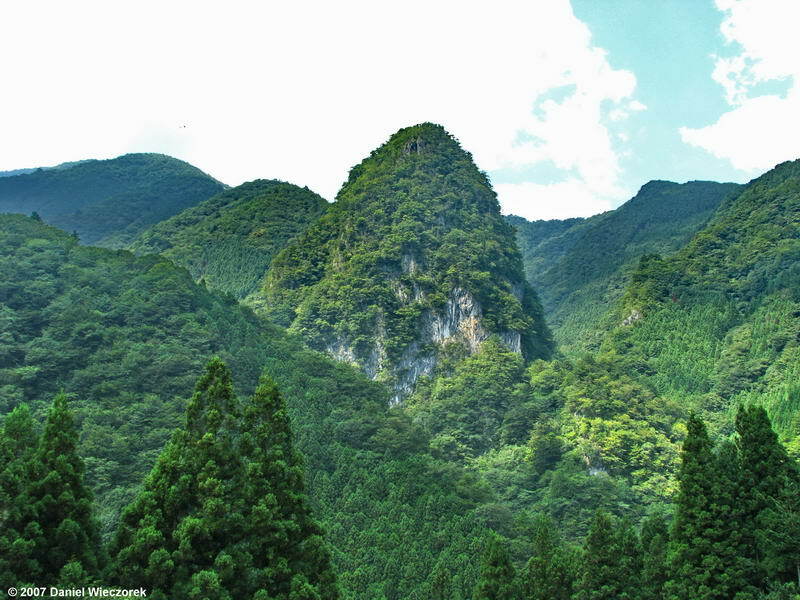 On August 19th Kazuya and I climbed Mt. Takao - for the 35th time. 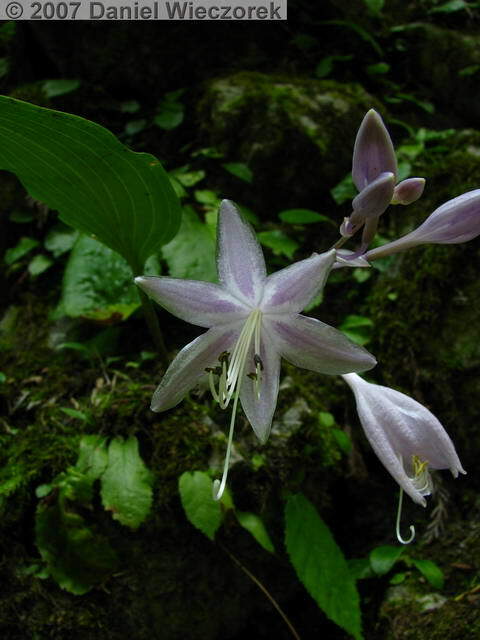 We did not find the particular flower we were searching for, so here are 3 photos of the Takao Shrine Area. 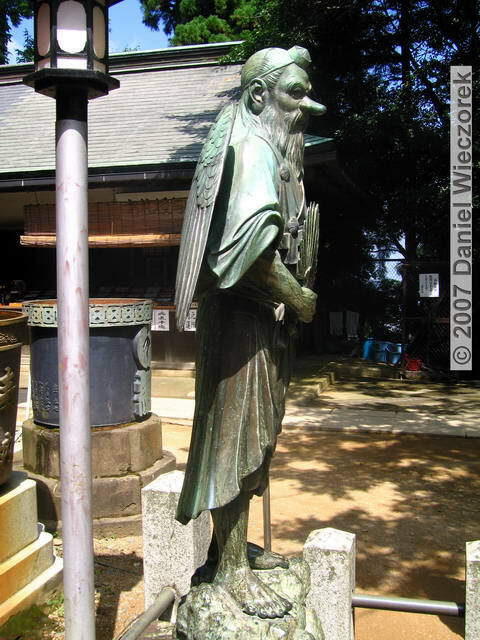 The first shot is one of the "long-nosed-Gods" (Tengu). 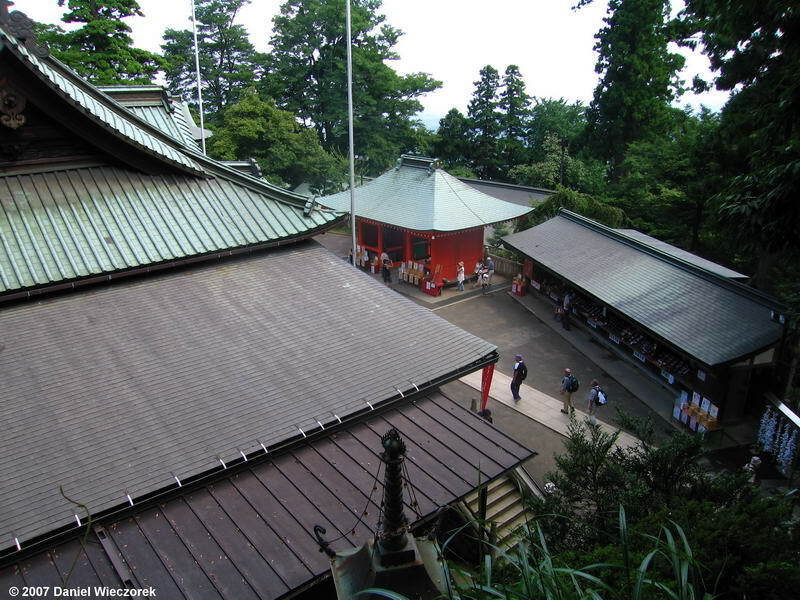 The 2nd shot is the shrine area from the hill above it and the 3rd shot is an interesting gable (you can see 1/2 of this gable in the previous photo). 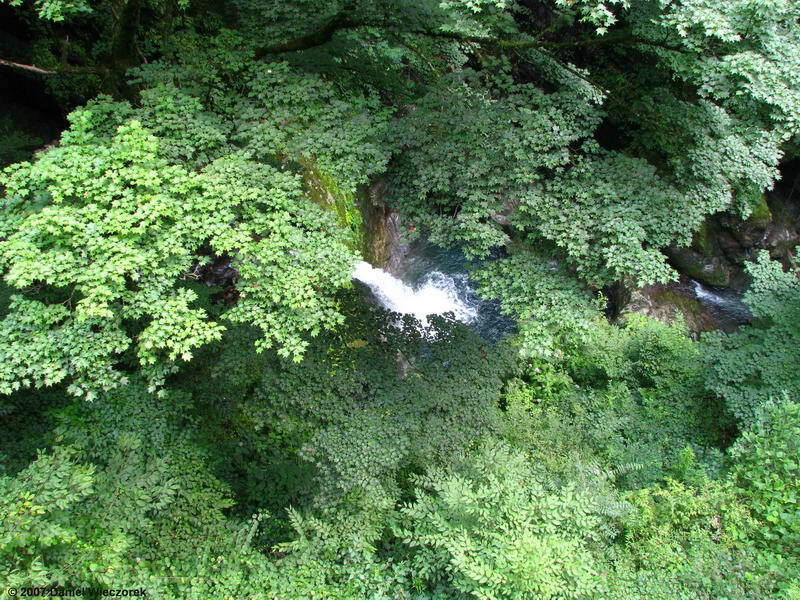 On August 26th Kazuya and I went to a new place - the Nippara Area. 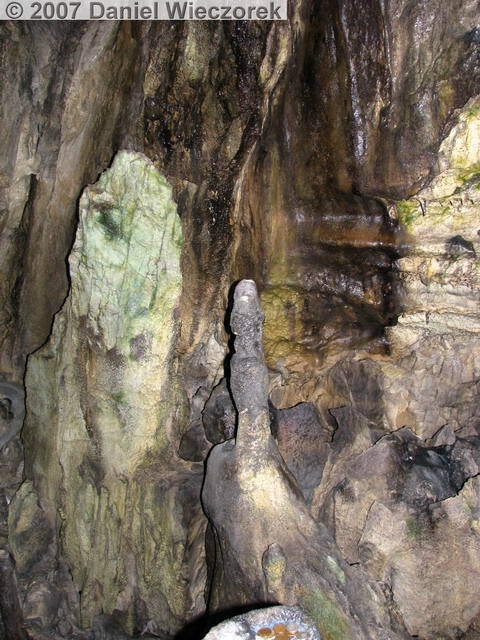 Our intention was to go to the Nippara Limestone Cave (open length = 800 meters; temperature = 11 degrees C). We took the bus from Okutama to Nippara (the end of the bus line) and then walked through the village of Nippara and up the road to the cave. 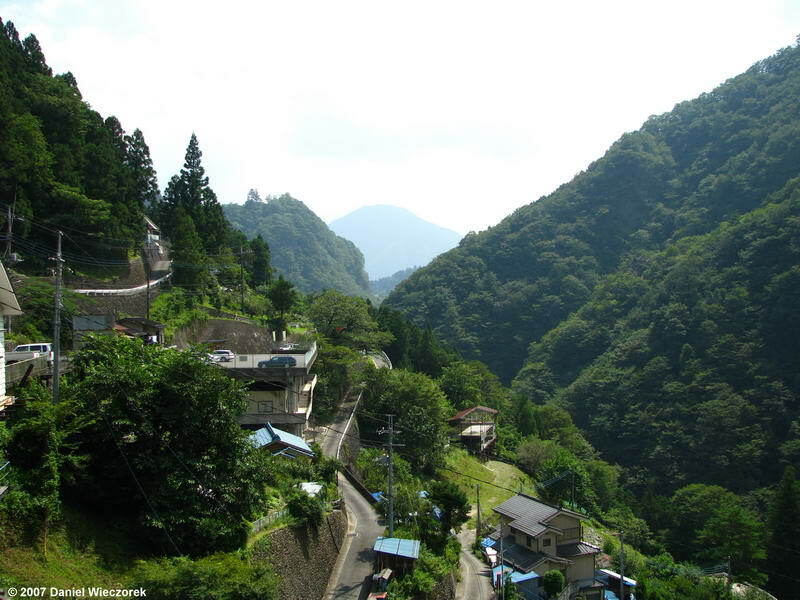 The first picture shows part of Nippara Village - looking back towards where we came from. The 2nd shot is a scene from near the bus stop. 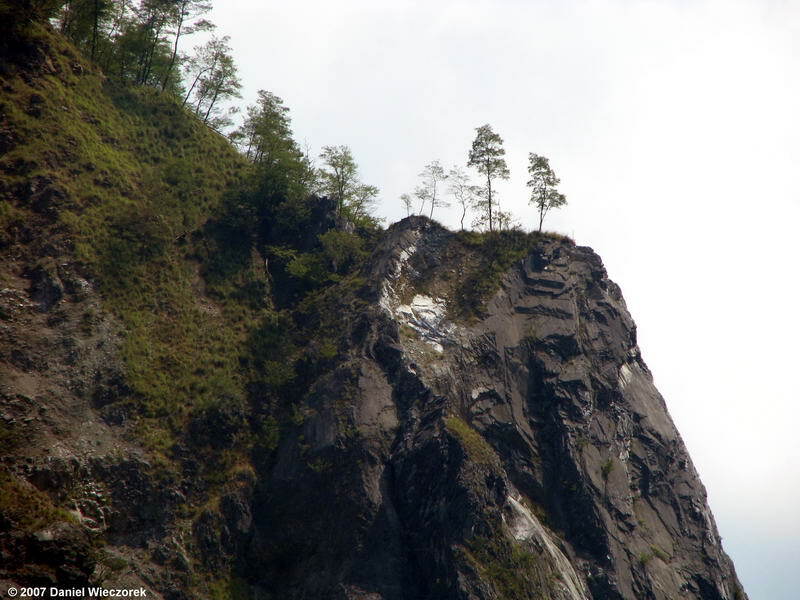 The 3rd shot is a telephoto shot of the same place. Oh, forgot to mention that I bought myself a new camera for by 60th Birthday and these are the first pics with that camera. It is capable of 12x OPTICAL ZOOM - very nice. It's a Canon PowerShot S5 IS. The first picture is the same one as the 3rd shot in Row 2, but I applied "Levels Correction" to this one. 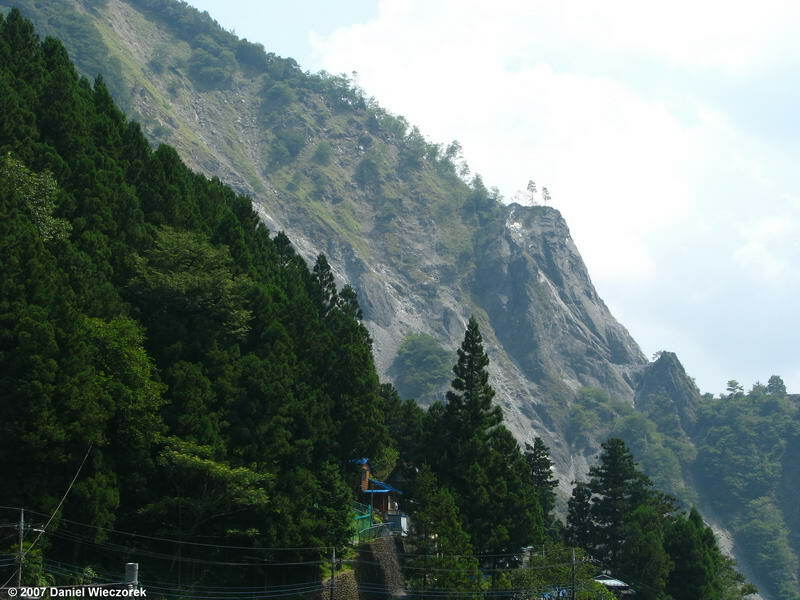 The 2nd shot is an interesting "mountain" which we passed between Nippara Village and the cave. 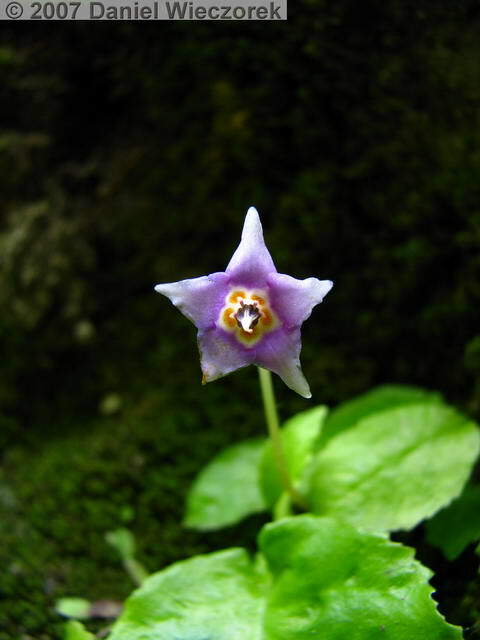 The third shot is an Iwa Tabako (Conandron ramondioides) we saw on the way to the cave. The first shot in this row is a Giboushi flower. 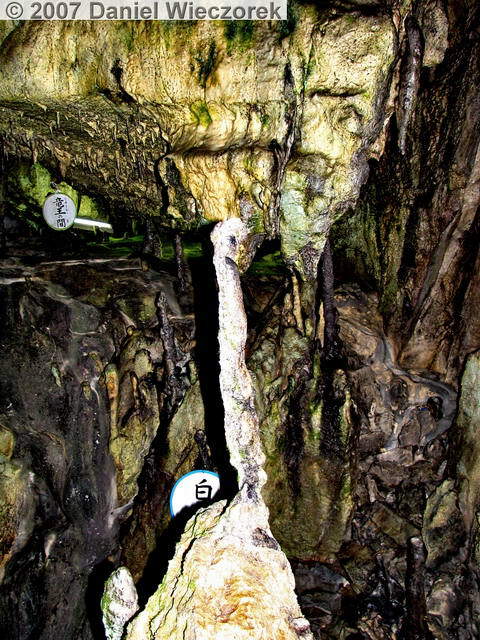 The 2nd shot brings us inside the Nippara Limestone Cave. 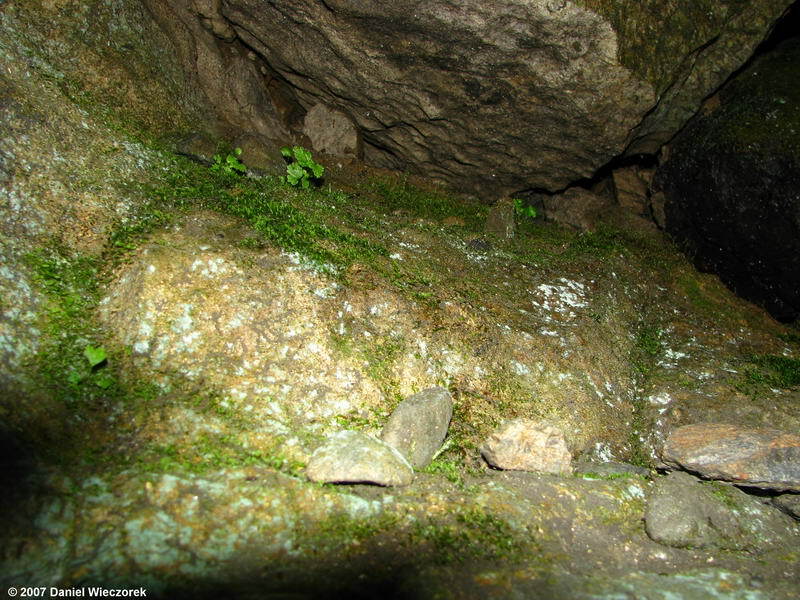 Note the plant life growing under the fluorescent light. 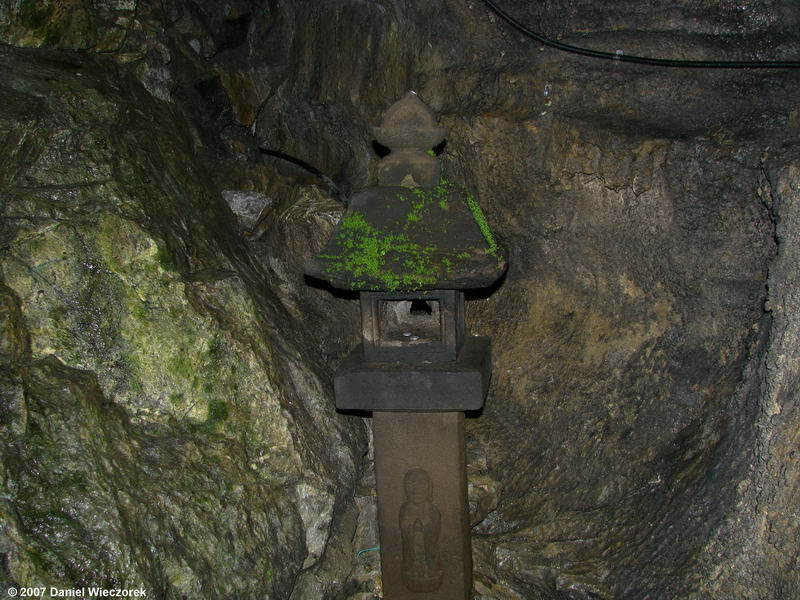 The 3rd shot is a small shrine in the cave, notice that it too has greenery growing on it - merely from the artificial lighting. 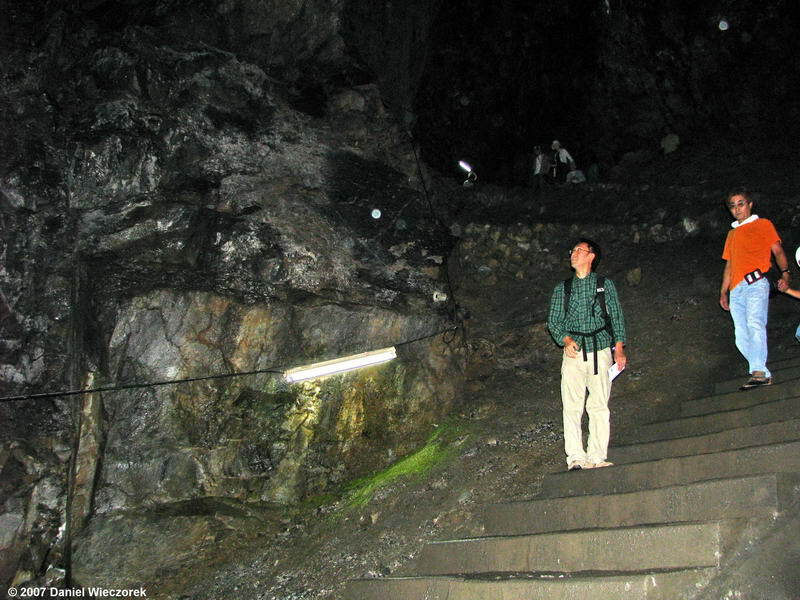 Here is Kazuya standing in one of the passages. 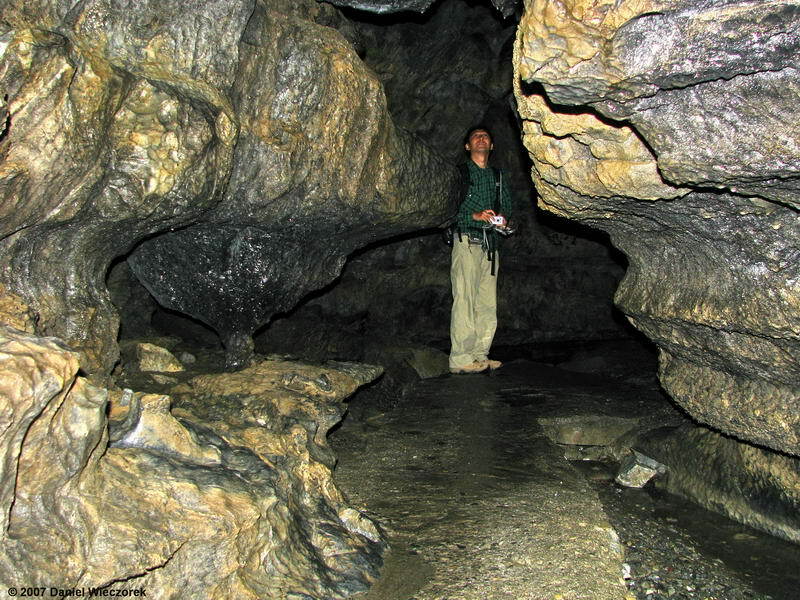 By the way, this cave does not give "guided tours" - you just pay the entrance fee and go in and explore along the "approved" path. 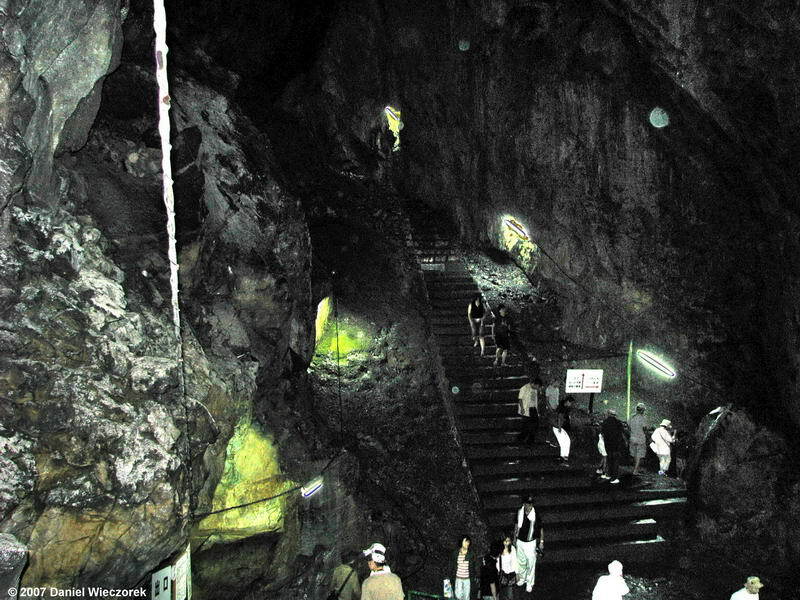 There are fenced off areas which are unlighted and signed with "entry prohibited" signs. 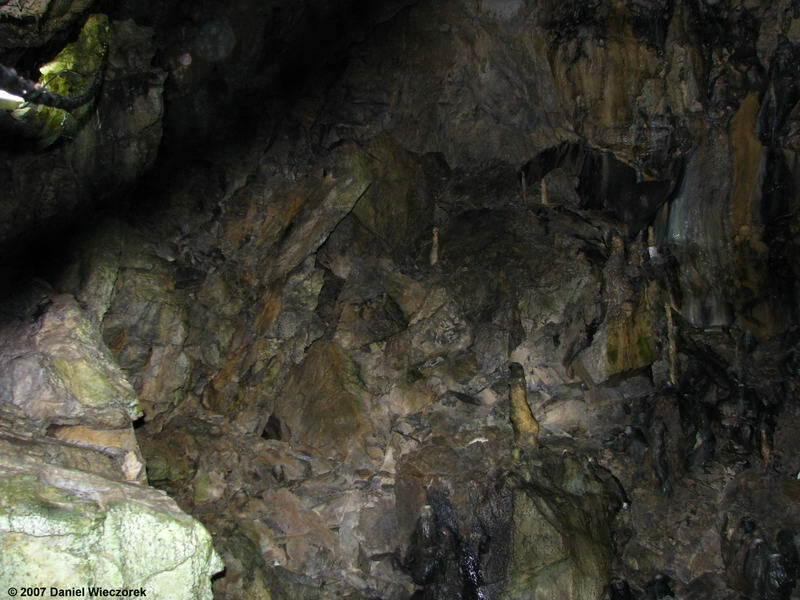 The 2nd shot gives you an idea of how large some of the "rooms" in the cave are, as does the 3rd shot. 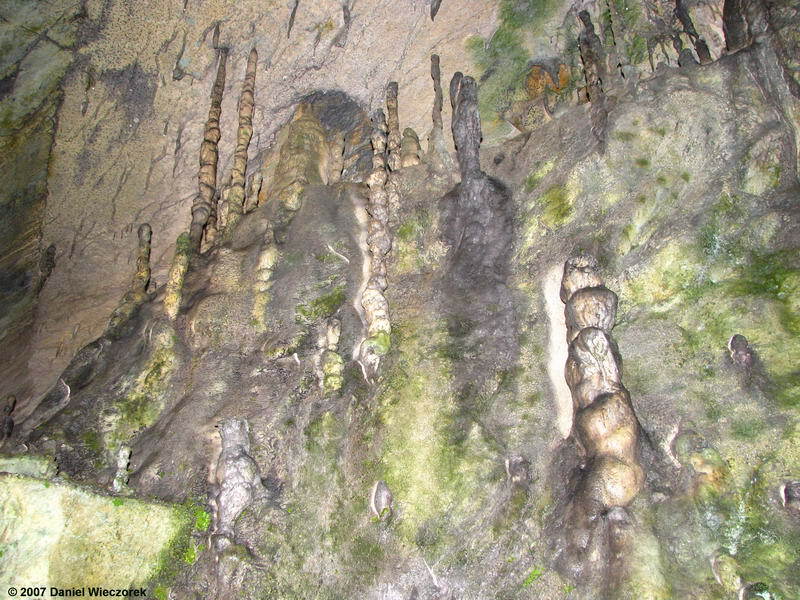 Here are some shots showing stalactites (=growing down from the ceiling) and stalagmites (=growing up from the ground). 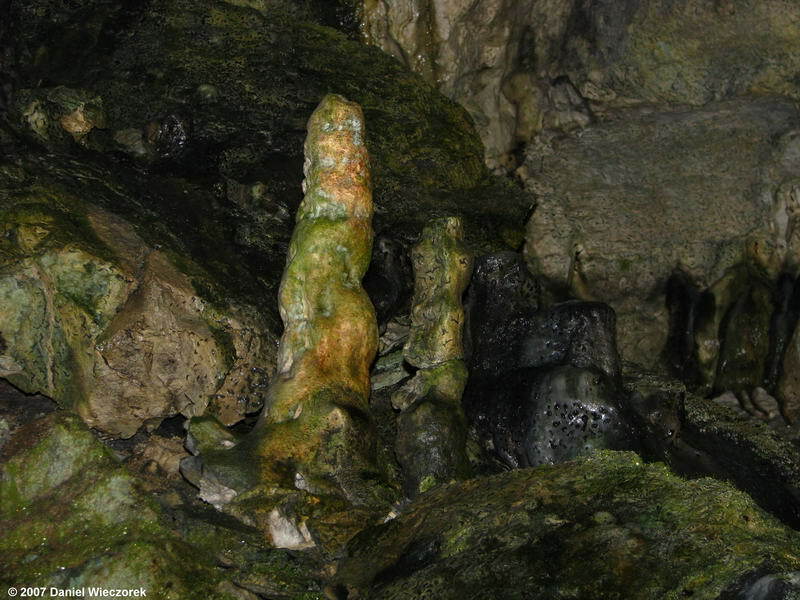 Here are 2 more shots of stalagmites. 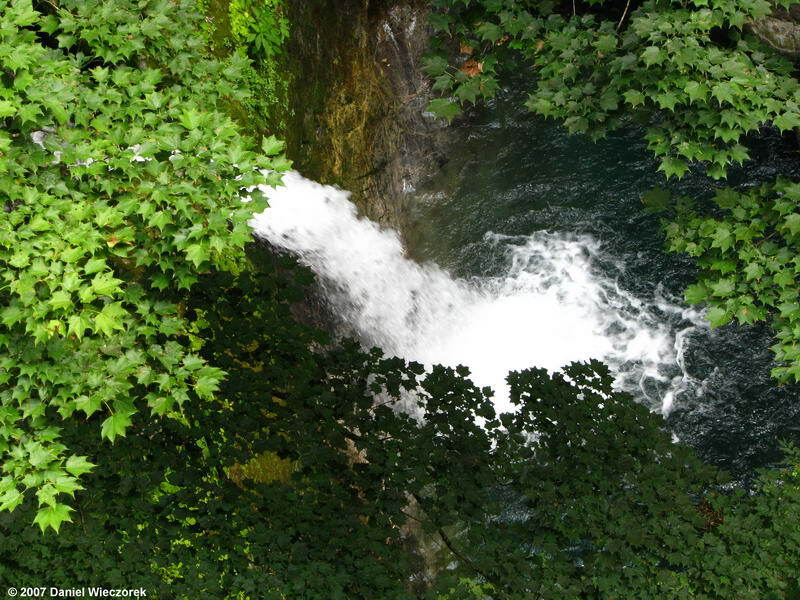 Just downstream from the cave was this waterfall - 2 shots of it. The first shot is no zoom and the 2nd shot is partially zoomed. These final 3 rows are some miscellaneous photos I took at the airport while learning how to use my new camera. The first shot here is a "Star Flyer" fleet aircraft - this company only has 3 planes in it's fleet. 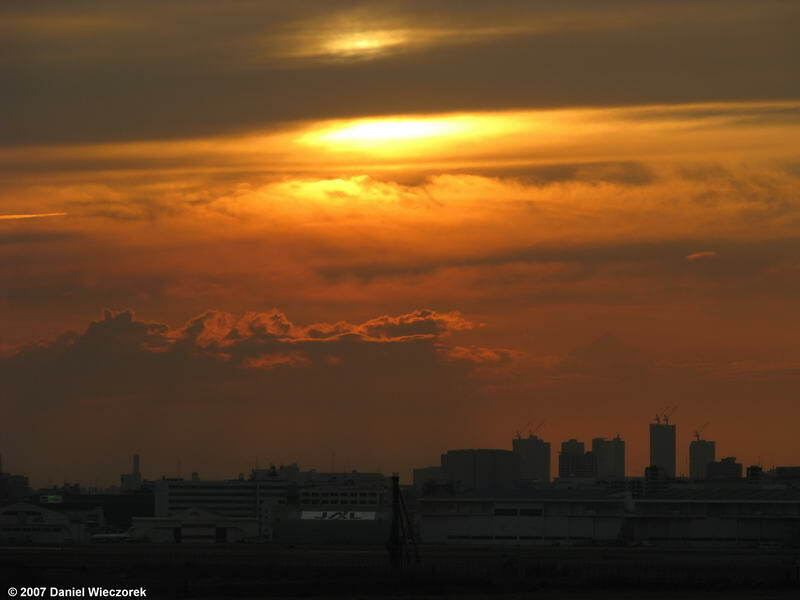 The 2nd shot is a sunset at the airport. Both of these shots were taken from our office window. 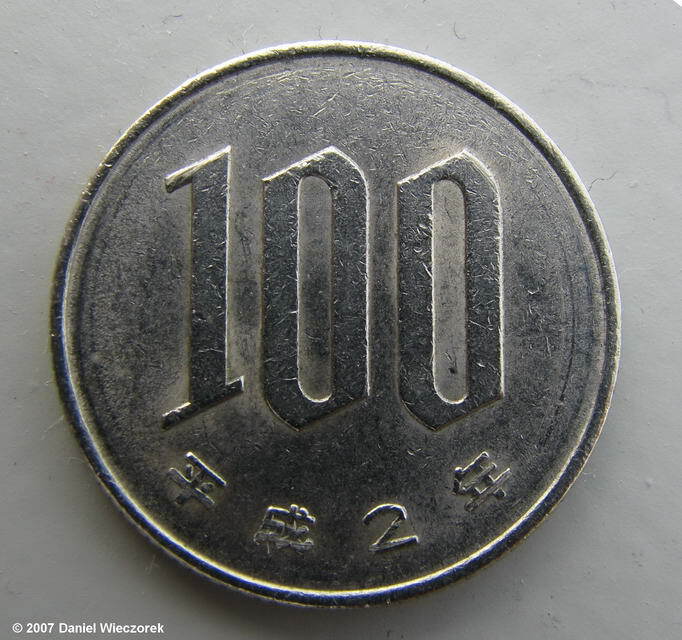 The 3rd shot is a macro-photo of a 100 Yen coin. The first shot here is an ANA (All Nippon Airways) Pokemon B747. 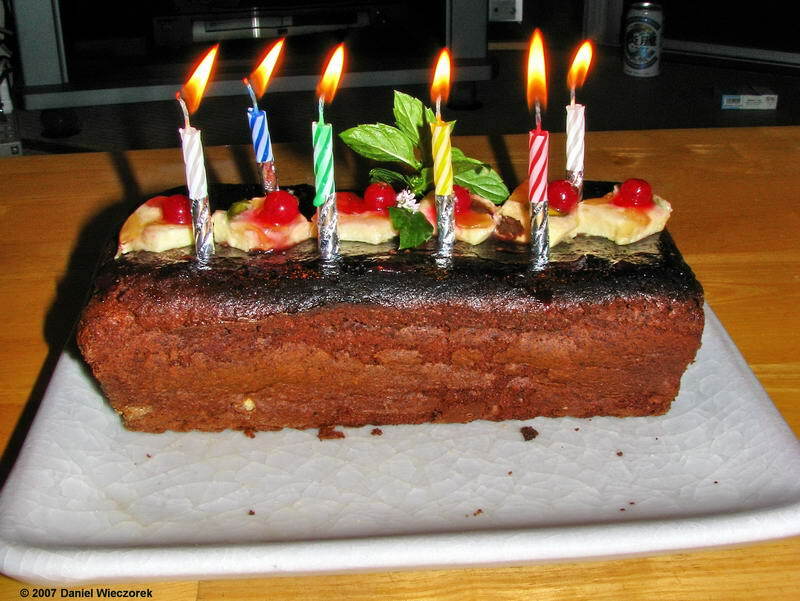 The 2nd shot is my 60th Birthday cake - made by Kazuya (one candle for each 10 years). 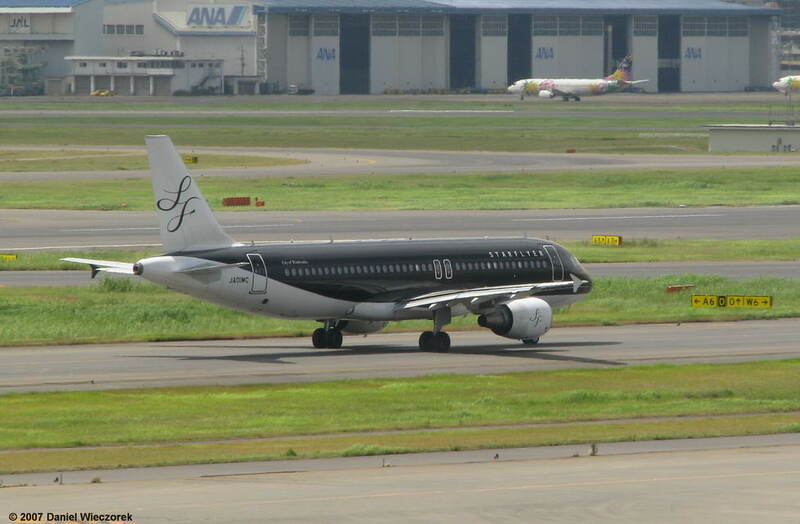 The 3rd shot is an ANA "Universal Studios Japan" plane. 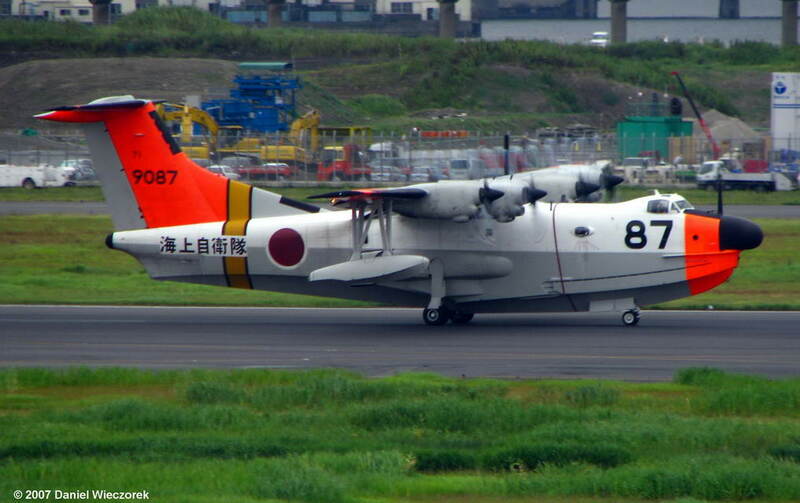 These 2 shots are a Shin Maywa US-IA amphibious STOL aircraft used by the Japanese Navy. You can find the original size of the first photo HERE (942 KB), The original size of the 2nd photo HERE (848 KB) and you can find a bunch more photos of this aircraft on airliners.net HERE.